At Throwback Sports, we create bags that are designed for fun. 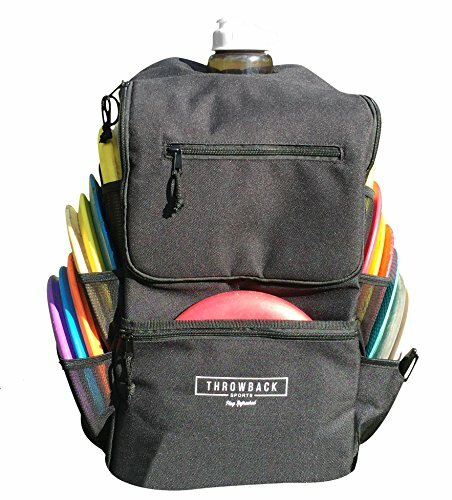 Sold exclusively on Amazon, the Throwback All Day Pack took all of your favorite things about disc golf and made a bag for them. You get a HUGE built-in cooler that can fit all your beverages and snacks along with an ice pack or 2 to keep things cold for the entire round. Simply unzip the main compartment and fill up your bag with all the refreshments you need for a day at the course. Like to Play All Day? Then you'll love the big cooler coupled with a 20 oz bottle holder that sits right on top of the bag to keep you hydrated. Thick padded straps and back mean that carrying the load has never been easier or more comfortable. Every disc is stored on the outside of the bag meaning there are no zippers, velcro, or anything else to fool with to find the right disc. Best of all, if you carry less than 16 discs the stretch pockets still feel like the right fit for you. What Else? The bottom of the All Day Pack is covered in water resistent tarpaulin fabric and wide plastic feet that give your bag a sturdy base. We've also included a small pen slot and 3 different zipper pockets to hold keys, phones, and other accessories. 1 Year Warranty - In addition to Amazon's 30 day return policy, we also give you a 1 year warranty against defects. If you have an issue, we'll make it right. If you have any questions about this product by Throwback Sports, contact us by completing and submitting the form below. If you are looking for a specif part number, please include it with your message.